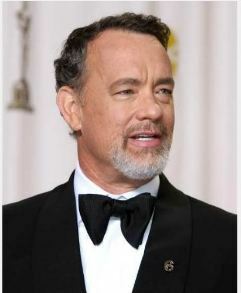 If you watched the Oscars with an obnoxiously scrutinizing eye like I did and read all of the follow-up fashion reports, you might have heard some buzz about one of my favorite men in Hollywood, Tom Hanks. He was wearing a metallic number 6 pin on his lapel, and the only explanation his publicist gave was that “It was for the veterans’ ‘got your 6’ campaign.” Nobody knows what that’s connected to, but now my eyes are peeled for more 6 bling. Based on our parsing of military jargon, the term “I’ve got your 6” derives from pilots’ use of clock points to describe directions. For example, if a plane is at your 12 o’clock, that would put it directly in front of you. If it’s at your 6 o’clock, it’s directly behind you, so someone who says they’ve “got your 6 o’clock” is essentially letting you know they’ve “got your back,” i.e. they’re looking out for you.